My parents came over this weekend to help us with the house. My mom and I painted the babies room. Three of the walls are a very nice shade of Hello, Yellow! 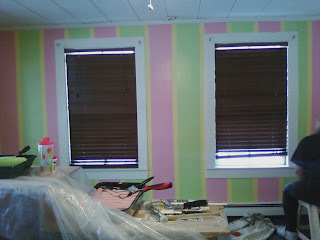 :) And the fourth wall we painted pink and green strips with yellow left in between. I'm excited at how cute its turned out.